What’s important really, as I kept telling you guys when we first started this here collaboration, is who ends up at the tail end of the points when everything’s said and done. Irina absolutely dominates the competition, and as my personal favorite to win the whole thing, I can’t say I’m surprised. The proprietor of The Zodiac Room, AstraGemini, clinches a solid and well-deserved second place after being the most consistent seasonalist (point-wise) over the entire duration of the games. 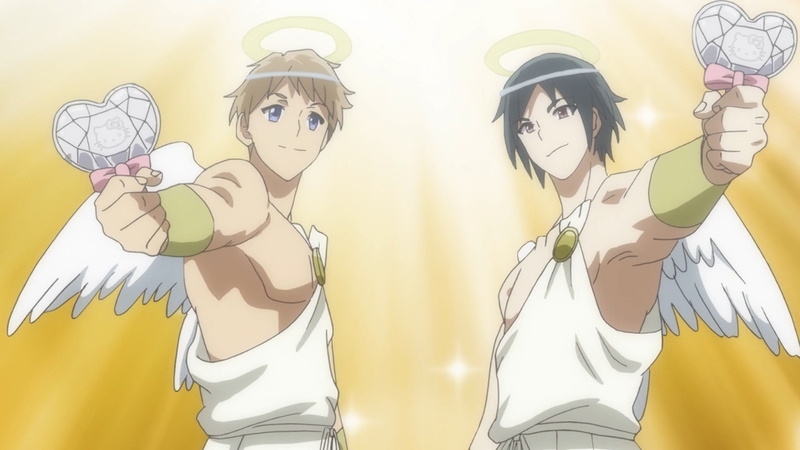 The Pantless Anime Blogger fires off a final salvo of ten points (!!!) but, alas, he falls short of overtaking me, but for real, I was actually a bit worried there for a second. Well-played, TPAB. And well-played everyone! It was a real grind of a race, but we all managed to cross the checkered line, and I’m glad to have shared these twelve-ish weeks with you fine folk. I’ll praise these guys more in my wrap-up post, along with my impressions and whatnot on The Winter Games as a whole so be on the look out for that one in the coming days. 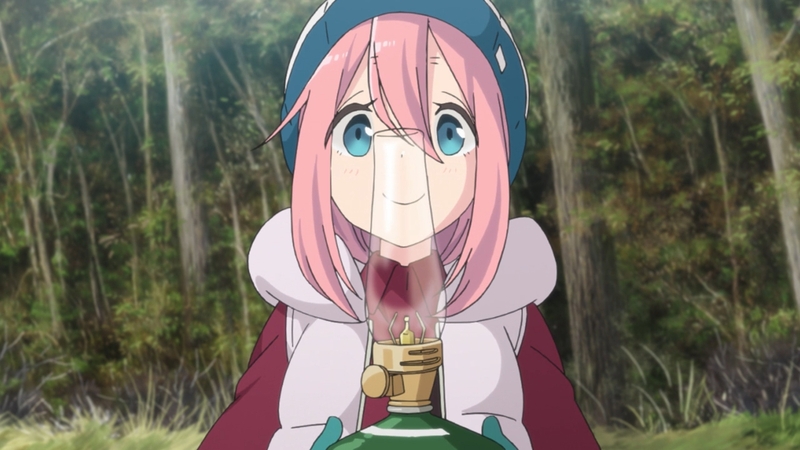 Well, here we are — the twelfth and final episode of Yuru Camp and I have to be honest with you guys, as far as anime endings go, this one was pretty alright for the most part. But I’m jumping the gun. Let’s savor these last couple of moments of this laid-back show one more time before closing the book on these cute camping girls. 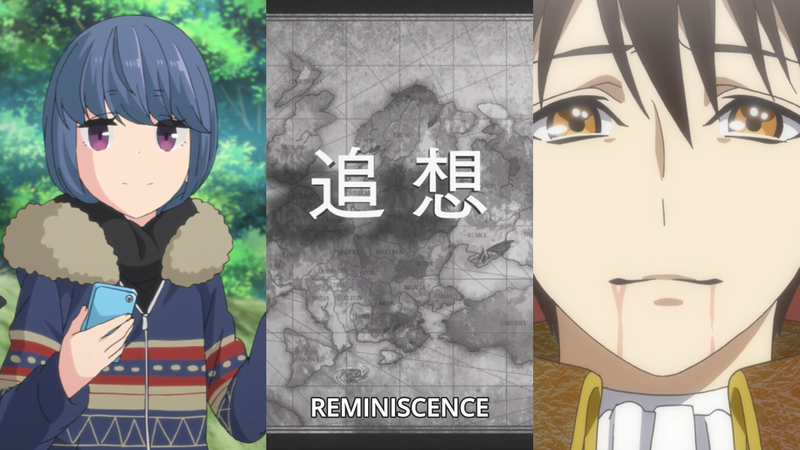 We start off with an almost believable timeskip scenario with Rin meeting up with Ena, Chiaki, and Aoi who’ve already set up camp at some place. It took me a couple of seconds to realize that the girls were aged up a good five or ten years (with them now significantly taller with hairstyles different to their original ones). 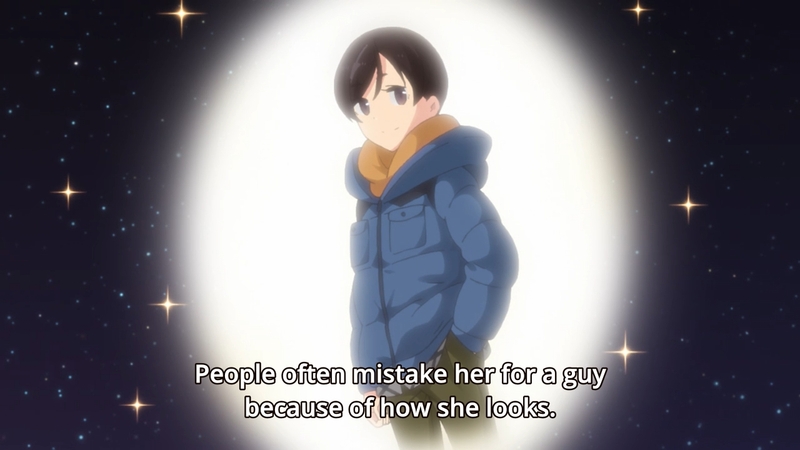 Rin notes that Nadeshiko is nowhere to be seen, followed by some exaggerated platitudes of Nadeshiko’s accomplishments as now a leading figure in camp gear and has since based herself in the US; which I really was ready to fully believe at the moment… until she made her entrance (xD). Apparently she was just throwing out a hypothetical to fill time while waiting for Rin to get back from her convenience store run for gas. 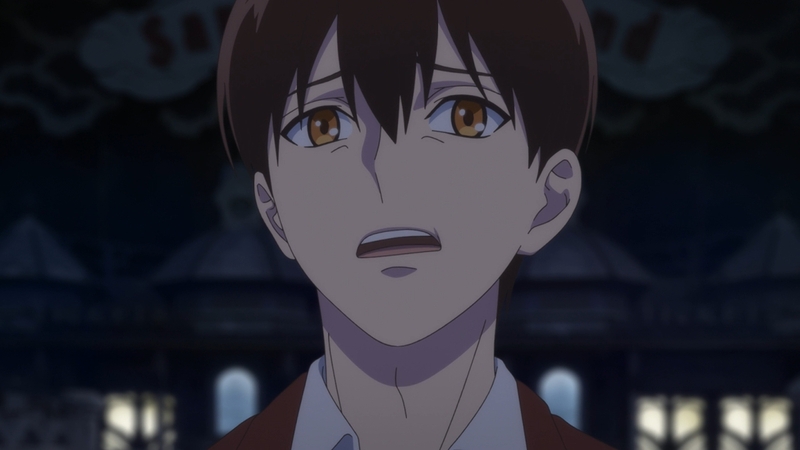 The episode formally starts as the girls begin to fully settle in for the night, but first they must say their goodbyes to Chikuwa who can’t stay the night (as Chihuahuas are apparently bad with the cold). Afterwards the girls, Toba-sensei included, take turns going to the baths — which in turn prompts another hair fixing session from Ena (lol) all before the girls settle in for the main event of the night’s festivities: a video marathon under the night sky (it’s funny how technologically inclineded their camps are with constant use of smartphones and now a tablet but I suppose that’s just a reflection of the changing of the times). 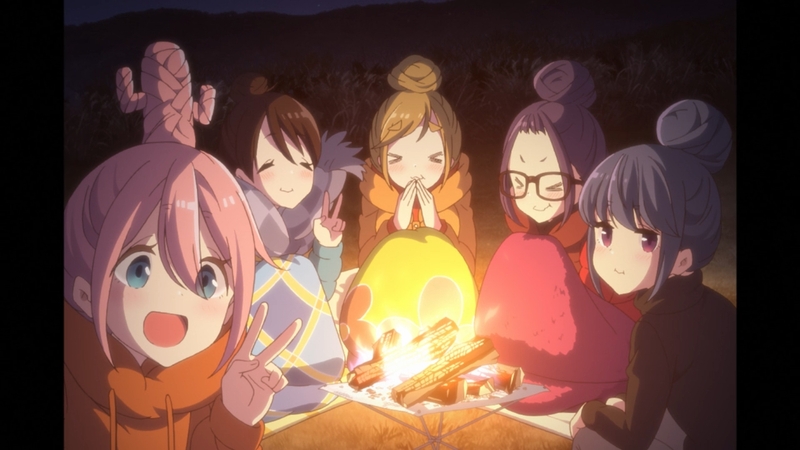 The girls watch vids until they feel the need to turn in, with Rin and Nadeshiko left as the last girls standing; where they share one more moment together (seriously, I should’ve threw out “Rin and Nadeshiko sleep in the same tent again” as a prediction, but hindsight is 20/20). The day breaks; signaling the culmination of their Christmas Camp, capped with Nadeshiko’s promised Japanese breakfast. The following scenes tie up more loose ends regarding the state of the OutClub and Nadeshiko’s part-time job. The final sequence is that of Nadeshiko riding up to Lake Motayasu (remember this place?) as we find out that she’s actually embarking on a solo camp much like how Rin was on the first episode. More than that, this is actually a “bookend ending” that more or less directly mirrors the events of the first episode (the difference now being that it doesn’t really end up being a solo camp for both Rin and Nadeshiko).The anime ends with the same picture taken in the opening sequence of the series now on the activity wall of the OutClub. Very nice. 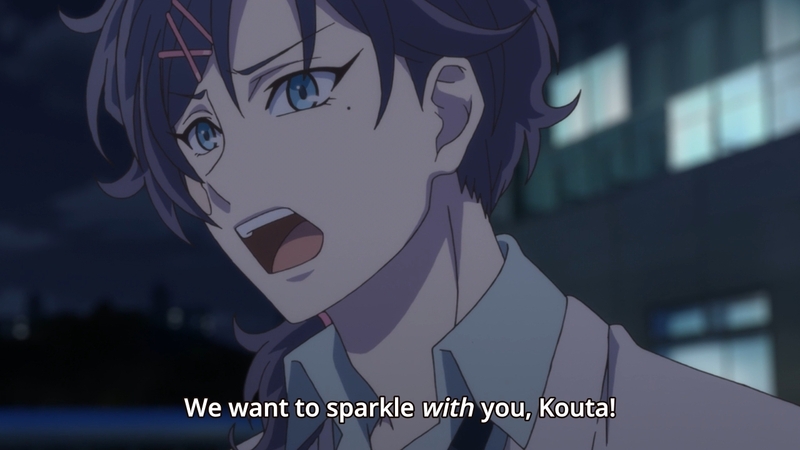 I can’t for the life of me understand why Yuu and the rest of the Sanrio Boys would almost literally throw themselves at this man who has so magnificently devolved from a passable (almost relatable) MC to a total wreck of a man-child. Granted the guy’s still in high school so he is young, as Astral and TPAB have pointed out on numerous occasions over the course of this entire series; but even still, if you really think about it (which is a lot to ask for this show so bear with me), at its very core Kouta’s main conflict is his self-vindication that he’s a “somebody” rather than a “nobody”, veiled underneath the pretense of wanting to do something with his friends. More on this in a little bit. This last episode (thank the gods) picks up from where we left off with the boys catching up to Kouta at PuroLand. Kouta keeps it 100 and basically tells them that he can’t help but feel inferior whenever he’s with them (a feeling which, on a certain level, I do understand). A shout-fest between Kouta and Yuu ensues before Yuu ultimately pulls out his trap card — an apology, which Kouta gobbles up like the starved attention whore that he is (pardon my French). But really, the other boys virtually did nothing wrong. It was all in Kouta’s head. If anything it’s he who should be apologizing for being so narrow-minded and self-centered all this time (which he does, but after Yuu apologizes first). The other boys chime in and shower Kouta with their desires of wanting to be his friend *groans* and the boys make nice and become friends again. Now that that’s done, all that’s left is their big musical which, amusingly enough didn’t really have much of a song to it (xD). I mean, I guess you could say that the background music was the “musical” part of it. Oh yeah! Speaking of the music. Damn, Macchi and Tsucchi are the best friends ever. I’ve said it before but I’ll say it again; Kouta does not deserve these two fine gentlemen. Not only did they help out by making their music for them despite Kouta being an absolute snob to them after he started hanging out with the Sanrio Boys, they even dress up and join their little production, just to cheer Kouta up and make him feel special. I’m being very vitriolic for sure but I’d be lying if I said this finale didn’t have it’s… good moments. We get to see Yuri again which is nice. I also like how they intersticthed all the earlier arcs in their play as a sort of callback to everything they’ve been through in their respective school lives. If there’s anything I’d give to this show is that it did have decent arcs barring this final one. And lastly, this episode did one of my favorite things an anime adaptation of something does sometimes by showing random new characters in the final episode (xD). This is done by production companies to spark interest in a second season (lol, could you imagine). It’s a shame Grancrest couldn’t join the festivities at this time as it was a recap this week, but I have been toying with the idea of carrying on with doing episodics for it, so we’ll see how that goes. If you haven’t yet, do give these guys a pat in the back for me will ya? 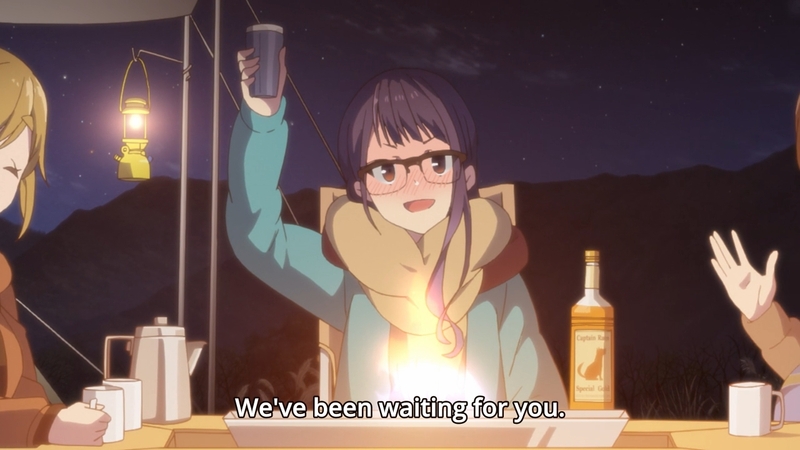 This entry was posted in Seasonal Posts and tagged Blog Carnival, Sanrio Danshi, Yuru Camp by Leap250. Bookmark the permalink. I can’t figure out why the other boys chase after Kouta either. 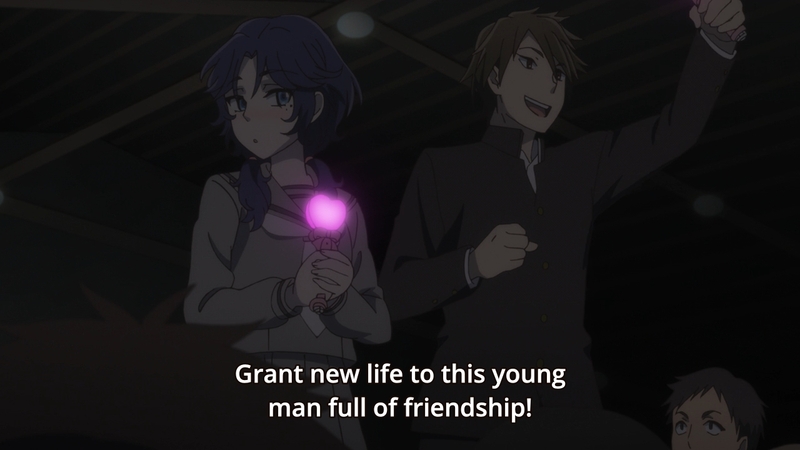 He’s a really horrible friend to those who were with him before he became one of the Sanrio Boys, and he essentially treats his new friends as competition. Really not worth the effort. Congratulations on completing the winter games. I like how the Boys’ flashbacks of Kouta is him spouting lines he couldn’t even do himself (taking everything on, leaving a friend in need, etc xD). Thanks Karandi, and likewise thanks for staying tuned throughout the entire thing. Some of us know it before the Games even started! This was a fun project – thanks for playing! Twas fun collabing with you Irina~! powtah leap, I’ll be crying in my oatmeal, lol.